Nick Chase is back in a new adventure! Nick Chase is back and ready for action! After a mysterious package arrives at his favorite bar, Nick has a new case! Discover who delivered the ancient artifact, and what exactly the curse of the Deadly Diamond is, as you explore gorgeous Hidden Object scenes and crack the case. 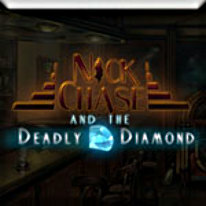 Solve perplexing puzzles to track down valuable clues in Nick Chase and the Deadly Diamond!